Innovative solutions and years of experience is behind the development of Spearhead's flailhead. Perfect cutting results and low maintenance costs are the result. 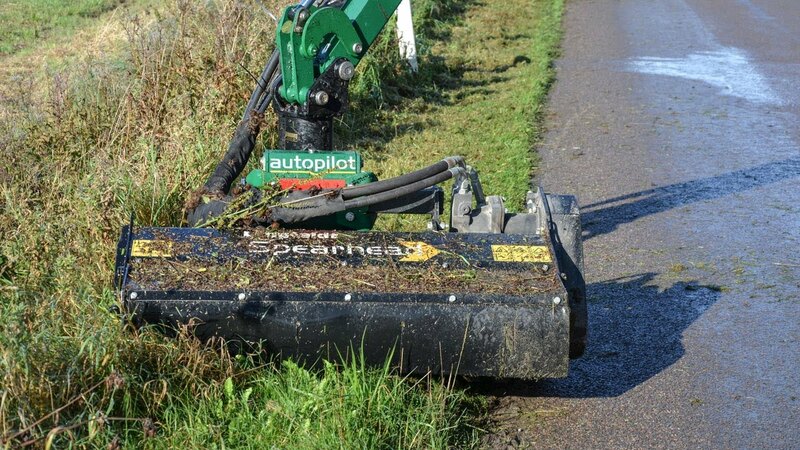 The flail mower attachments have a working width between 1.2 and 1.6 m and can handle branches up to 35 mm in thickness. The flail mowers of the MP series can be attached to excavator or tractors through a reach arm. Optional choice of belt or direct drive. Recommended for light hedge trimming (3-4 cm) and grass mowing. Leaves a perfect cut. Recommended for hedge cutting 6-7 cm, reduced capacity in grass. Boot flail mounted in shackles. Recommended for areas with lots of stone along with hedge and branches. Back to back flail. Recommende for rough and stony terrain, where cutting quality is of little or no importance. Large capacity but cutting of poorer quality. Good for light hedge trimming (3-4 cm) and grass mowing. Leaves a perfect cut.